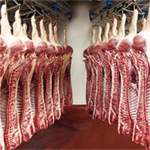 At Bens we produce quality pork meat and pork carcasses. Our company slaughters 20.000 swine and produces 1000 tons of pork meat weekly, and the customer base ranges from the local quality butcher to the bigger international meat companies. Our extended and sharply priced product range meat products can be delivered fresh or frozen. Bens works according to �nd meets the most strict quality standards. With our modern automated cutting plant, own cold storage and efficient transportation, we�re at your service everyday.